As the end of June looms, I start to make my checklist and gather my Fourth of July supplies… if you’re thinking that includes a picnic blanket, some bug spray, and paper plates, you haven’t lived with a pet who starts anxiety drooling and pacing as the sun goes down in the days leading up to Independence Day, even before the fireworks start! It will be my 11th year of living through July 4th with my 80-pound quivering fireworks-phobic dog, and in that time I’ve figured out a few tricks that have helped reduce his full-on trying-to-escape-the-house panic attacks to mild, manageable distress. In all my research, I’ve discovered some tips that might help other pet owners keep their pets safe during one of the most dangerous times of year for dogs and cats. (Many animal shelters experience the highest single day intake rates of stray cats and dogs on the 4th of July evening.) 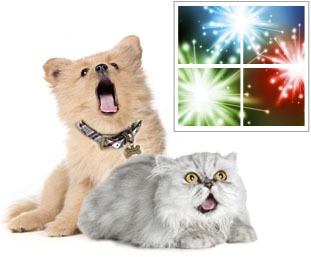 Read on for my Fourth of July Fireworks Pet Safety tips! Microchip. Haven’t gotten a microchip for your pet yet? Now is a great time! Call the micochip company to make sure the chip is registered with your current information. Photos of your pet. If they get out, you’ll want photos to make lost pet flyers. Have a clear body shot and face shot somewhere you can access quickly. Pet GPS. Yes, several companies now sell a GPS transmitter designed to attach to your pet’s collar! The units I’ve seen are of a size & weight suitable for dogs or cats (on a safety release collar of course) who are at least 10 pounds. Test the units out before the 4th so you’re familiar with how they function best. At dusk, bring your pets inside your home. Even if they are usually fine outdoors and have been fine in previous years, there is a reason so many pets end up in the shelters on the 4th of July. You never know when someone is going to set off a firework close enough to frighten your pet into bolting, even over or through a fence that contained them before. Party time? Don’t take your pet to celebrations. Your pet is safest inside your own home. If you are having people over, even just a few, lock your pets in a bedroom or in a crate, and ask each guest not to let them out no matter what. Keep windows AND doors closed & locked. Startled pets have been known to push or jump through screens or even cracked windows. Keep doors to the outside closed during and after when fireworks are going off, to prevent pets from bolting and slipping past you as you exit or enter. Pets can stay stressed for hours after the fireworks stop – don’t discount they may bolt even after the fireworks have died down. If possible, keep pets locked out of rooms where a door to the outside might be opened. Turn on the TV or music. Put the volume as loud enough to muffle any fireworks noises, but it doesn’t have to be blasting! If you have a CD player, definitely check out Through A Dog’s Ear — the Adopt-a-Pet.com staff uses this for their anxious dogs and they really help! Ignore their fear. Let them hide if they want, but don’t coax or pay attention to a pet exhibiting fearful behavior. You don’t want to unintentionally reward scared behavior. Also, if you are calm and relaxed, this can help your pet more. Engage with special toy or chew. Give your pet a super-yummy food-stuffed toy or long-lasting chew treat. Some pets are too scared to eat, but for food-motivated ones, this can distract. Exercise daily. Exercise helps relieve stress, so daily release is a huge help. Schedule dog walks for early mornings when fireworks are least likely to go off. Cats benefit from indoor playtime exercise too. Thundershirt. This reportedly helps with fireworks too! Order online at thundershirt.com. Have a safe Fourth of July! We hope these pet safety tips help.